Dr C rang yesterday to say my dose is waiting. This morning at 10 I become a guinea pig. Apparently health workers, pregnant women and the elderly are first in line. I am perhaps in one of those categories. But would I actually wear it? Well, I may in places like the doctor’s waiting room – a great place to get flu – or on the bus. 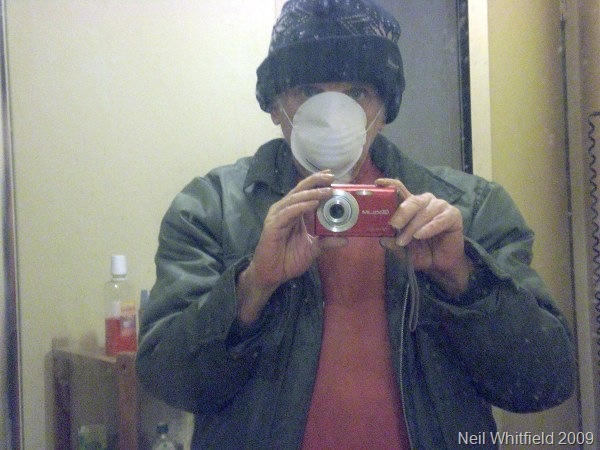 See Melbourne the swine flu capital of the world. MELBOURNE is now the swine-flu capital of the world, with the H1N1 virus twice as prevalent in the Victorian population as it is in Mexico, where the pandemic began. In total, Australia now has 1006 confirmed cases of H1N1, 874 of those being Victorians. With the state’s comparatively small population, this means swine flu occurs in about one in 9139 Victorians – more than double the one in 21,860 Mexicans with the virus and triple the one in 27,295 people with swine flu in the US. The Singapore Government posted a health warning on its website advising residents to defer non-essential travel to Victoria. And it is warning Singaporeans returning from Victoria to be alert for any flu-like symptoms. But of course I am not in Victoria. By sheer chance my current batch of my little pills is lactose-free! I get the generics, and thus far have never had the same brand twice. All so far have lactose as a filler, except this lot. This is a shame, as I (like many others) am lactose intolerant, and the lactase tablet antidote only works so far. I’ll try to make sure future batches are the lactose-free ones. My story will be in the June South Sydney Herald and I have a feature coming up in July. No stats today as the end is nigh – of the month, that is. Spotted on Arts & Letters Daily. Very interesting review article: Free market faith by Caspar Melville on New Humanist. Another day, another denunciation of Dawkins and Hitchens and their fellow New Atheists. No sooner have we absorbed Chris Hedges’ I Don’t Believe in Atheists (2008), Tina Beattie’s The New Atheists: The Twilight of Reason and the War on Religion (2008) or David Bentley Hart’s Atheist Delusions (2009) when along comes God is Back: How the Revival of Religion is Changing the World, by Economist journalists John Micklethwait (pictured right) and Adrian Wooldridge. Secularists might find some of the arguments in this book hard to swallow, though they should welcome the opportunity to sharpen their own against them, but as a clear and convincing case for the separation of religion and politics, it counts as a considerable, and unapologetically secular, achievement. In the summer of the year 1797, the Author, then in ill health, had retired to a lonely farm-house between Porlock and Linton, on the Exmoor confines of Somerset and Devonshire. In consequence of a slight indisposition, an anodyne had been prescribed, from the effects of which he fell asleep in his chair at the moment that he was reading the following sentence, or words of the same substance, in Purchas’s Pilgrimage: “Here the Khan Kubla commanded a palace to be built, and a stately garden thereunto. And thus ten miles of fertile ground were inclosed with a wall.” The Author continued for about three hours in a profound sleep, at least of the external senses, during which time he has the most vivid confidence, that he could not have composed less than from two to three hundred lines; if that indeed can be called composition in which all the images rose up before him as things, with a parallel production of the correspondent expressions, without any sensation or consciousness of effort. On awakening he appeared to himself to have a distinct recollection of the whole, and taking his pen, ink, and paper, instantly and eagerly wrote down the lines that are here preserved. At this moment he was unfortunately called out by a person on business from Porlock, and detained by him above an hour, and on his return to his room, found, to his no small surprise and mortification, that though he still retained some vague and dim recollection of the general purport of the vision, yet, with the exception of some eight or ten scattered lines and images, all the rest had passed away like the images on the surface of a stream into which a stone has been cast, but, alas! without the after restoration of the latter! The dreams are never scary, generally just about everyday stuff…. sometimes i find it quite enjoyable as i remember the dreams from the night before through out the day! Only occasionally do I remember them throughout the day. One example is here. I read about this first on Matilda, Perry Middlemiss’s OzLit blog. A couple of weeks back James Bradley, on his "City of Tongues" weblog, reprinted an essay he had written and had published in "The Griffith Review". The title of that essay was "On Depression and Creativity", which was reprinted, in an edited version in "The Age" Review section over the weekend [not currently on the paper’s website]. In the same spirit I refer you to Never real and always true: on depression and creativity. I found it personally interesting too of course. Jim Belshaw went rather over the top in his title, but I do agree with the post: NSW strikes another Hitlerian blow. The issue, as Jim says, is one of compassion versus “being right”. A ban on smoking in all psychiatric facilities will go ahead despite vehement opposition from some members of the mental health community, who argue that strict anti-smoking rules will destabilise acutely ill patients and put staff at risk of violence. NSW Health has ordered all facilities, including emergency psychiatric centres, to close designated outdoor smoking areas, confiscate tobacco products and supply free nicotine replacement therapy to staff and patients. If accurate, this is one of the most inhumane statements I have ever heard. A comment from a schizophrenic endorsed that, as did I. So too in today’s Sydney Morning Herald letters does a practitioner in the field. As a doctor I strongly support anti-smoking policies. But there are specific issues relating to mental health patients that make the move against smokers by NSW Health deplorable ("Tobacco ban leaves mental health groups fuming", March 19). Mental health patients may be voluntary or involuntary. Voluntary patients may simply stroll off the hospital grounds to smoke. But involuntary patients are detained against their will in hospital under the Mental Health Act and are not allowed that liberty. They are by definition so mentally disordered that the last resort of the act has been invoked because they may be a risk to themselves or others. These patients are frequently agitated and smoking is one method they use to calm down. In this state they lack the capacity to consider the benefit of stopping smoking, and this is clearly not the time in their lives to introduce intransigent non-smoking rules that only escalate their agitation. In the past these patients were allowed to go outside to smoke escorted by security staff, but since the introduction of smoking bans they may no longer do so. In hospitals all over NSW these poor individuals are being physically restrained and given sedative drugs when their agitation escalates. This infringes the spirit of the Mental Health Act, which stipulates that it may be invoked to detain a person only when there is no less restrictive means of doing so. Clearly allowing them to smoke is far less restrictive than physical restraint and sedation. We already make these patients suffer protracted stays in crowded emergency departments, due to the failure of NSW Health to provide beds for them. It is easy to imagine what effect this has on individuals who are at the lowest ebb of mental wellbeing. To add insult to injury they are now told that their last vestige of self control – to seek solace with a smoke – is being withheld, in what must seem an arbitrary and cruel act by their carers. Doctors are placed in the unenviable position of choosing to restrain the individual or to let them out on their own, with the risk they may abscond and harm themselves. What a sad state we have sunk to. There is a contrary letter too, but I know from experience and observation that the idea really is a bad one – whatever you think about smoking. Jim also expresses lack of surprise over the defeat of the alcopops tax, and I agree in fact that it was never the most brilliant of ideas and suspiciously like a tax grab rather than a well thought out policy on the social problems caused by alcohol. On the other hand, imperfect as it was, I am sorry it was defeated, particularly because I think Senator Fielding (Family First) was using his new-found power in a naive and unconsidered way. Pass it and agitate in future for better, I would have thought, which is more or less Bob Brown’s position. All that has been achieved is another problem for the economy. 2. That alleged list of sites on the government’s internet filter black list. My position on the folly of the involuntary Net Nanny the Rudd government is so keen on is clear enough from the top of my side bar. Recently a certain site, which apparently is now on the black list itself, published what it says is the black list. That leaked list included a number of very odd choices. See Dentist, tuckshop cited on web blacklist. Websites contained on it will be blocked for all Australians once the government implements its mandatory internet filtering scheme – originally pitched as targeting only "illegal" content – later this year. But, as experts have long warned the government, having a top-secret blacklist of banned sites is dangerous because there is a real danger that Australian businesses could be added to the list in error, with little recourse. Bruce has posted (with ironic discretion) here, Arthur here, and Pip Wilson here — “Senator Conroy’s and the Australian Labor Party’s infantile Internet witchhunt”. Go to Wikileaks threaten Conroy with extradition proceedings. “Scientists now belive mental abilitites decline from age 27” (sic) says the Daily Telegraph this morning; clearly someone over the age of 27 must have composed that headline! And to think how rabid the Murdoch press is sometimes on the matter of declining standards in literacy! The new research, reports The Mail on Sunday newspaper in the UK, shows that our mental abilities begin to decline from the age of 27 after reaching a peak at 22. The researchers studied 2,000 men and women aged 18 to 60 over seven years. The people involved, mostly in good health and well-educated, had to solve visual puzzles, recall words and story details and spot patterns in letters and symbols. Similar tests are often used to diagnose mental disabilities and diseases, such as Alzheimer’s and other forms of dementia. The research at the University of Virginia, reported in the academic journal Neurobiology Of Aging, found that in nine out of 12 tests the average age at which the top performance was achieved was 22. The first age at which performance was significantly lower than the peak scores was 27 – for three tests of reasoning, speed of thought and spatial visualisation. Memory was shown to decline from the average age of 37. In the other tests, poorer results were shown by the age of 42. Professor Timothy Salthouse said the results suggested that therapies designed to prevent or reverse age-related conditions may need to start earlier, long before people become pensioners. Good news for Thomas, among others, I suppose. You have to subscribe to Neurobiology of Aging to read the original, but there is an abstract. Cross-sectional comparisons have consistently revealed that increased age is associated with lower levels of cognitive performance, even in the range from 18 to 60 years of age. However, the validity of cross-sectional comparisons of cognitive functioning in young and middle-aged adults has been questioned because of the discrepant age trends found in longitudinal and cross-sectional analyses. The results of the current project suggest that a major factor contributing to the discrepancy is the masking of age-related declines in longitudinal comparisons by large positive effects associated with prior test experience. Results from three methods of estimating retest effects in this project, together with results from studies comparing non-human animals raised in constant environments and from studies examining neurobiological variables not susceptible to retest effects, converge on a conclusion that some aspects of age-related cognitive decline begin in healthy educated adults when they are in their 20s and 30s. Now I do have a large hat size, so I am encouraged by another bit of research I found here. Confirming earlier studies, a British study of 215 men and women aged between 66 and 75, has found that the larger a person’s head, the less likely their cognitive abilities are to decline in later years. Those with the smallest heads had a fivefold increased risk of suffering cognitive decline compared with those with the largest heads. Encouragingly, however, this doesn’t mean you’re doomed at birth — the researchers found that it wasn’t head circumference at birth that was important, but head size in adulthood. During the first year of life, babies’ brains double in size, and by the time they are six, their brain weight has tripled. These, it appears, are the crucial years for laying down brain cells and neural connections — pointing to the importance of providing both proper nourishment and intellectual stimulation in these early years. The study appeared in the October  issue of Brain. Nonetheless, I can report signs of cognitive decline in some areas at least, especially in an increase in those pesky “senior moments” when a word or a name just eludes me. Common enough. I would say in my teaching I had two peaks – one around the late 20s to early 30s, the other in my fifties.